For top quality products for all your painting and decorating needs, look to the Dynamic brand. With more than 30 years in the business, we deliver the best selection of products for do-it-yourselfers and professionals. Our dedication and commitment to quality and innovation means you always get the very best from Dynamic. 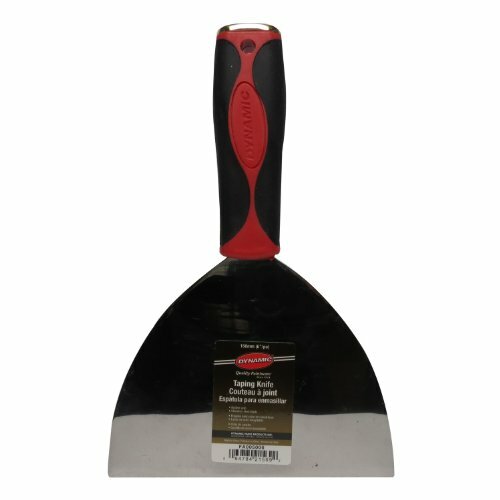 The Dynamic Professional Rubber Grip Putty Knife with Hammer Ends is built to last! It features a comfortable rubber grip to spare your hands during long, tiring jobs, while the hammer end is great for setting popped nails. There is a sturdy, stainless steel blade which offers a new conventional design. Dynamic paint products set the industry standard with an extensive assortment of painting tools and accessories. Whatever painting or decorating project you're planning, count on Dynamic brand paintware - and get painting!